INDEPENDENT RESEARCHERS REVEAL SOME OF THE KEYS TO ONE TAM’S SUCCESS! Independent researchers have found that One Tam’s successes have led to the development of a new model—the Partnership Impact Model™ for measuring partnership impact. One Tam’s vision that we can do more for Mt. Tam together, working across boundaries, than we can alone was affirmed in the findings of a newly released four-year (2014-17) independent study—Generating, Scaling Up, and Sustaining Partnership Impact: One Tam’s First Four Years—on the impact and value of partnerships. One Tam’s work was central to the research, which identified a system of 11 interdependent, scalable impacts that are essential to starting, building and sustaining partnerships. 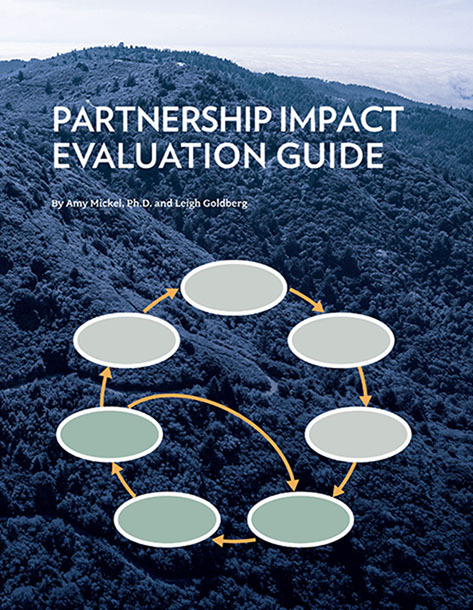 A second publication—the Partnership Impact Evaluation Guide—provides an additional tool for partnership practitioners on ways to evaluate and create impact metrics. It also provides guidance on how to measure impact indicators over time. Explore the research and get the guide by clicking on the documents at right. The 11 Partnership Impacts is a framework that explicitly highlights the collection of impacts that landscape-scale stewardship partnerships should consider when it comes to delivering and measuring the value of their collaborative initiatives; it can be used to help identify what impact looks like for them. 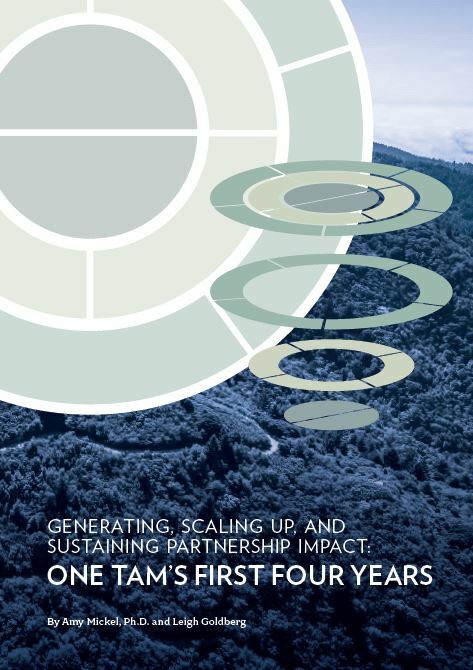 Scaling Up Partnership Impact illustrates the dynamic process and interdependence between foundational, operational, and outcome impact classifications in order to generate, scale up, and sustain impact throughout the partnership lifecycle. The Partnership Impact Roadmap and the 7 Steps of Partnership Impact Evaluation are designed to provide guidance to multi-sector partnership practitioners and funders undertaking long-term, systems-level collaboration on how to identify, define, and measure various indicators of impact. To optimize and scale up partnership impact, these resources should be used together by collaboratives to help define, convey, and evaluate their impact. Most importantly, the One Tam team would also like to thank the many dedicated organizations and individuals who contributed to this study, and the many generous donors, members, ambassadors, and thousands of incredible volunteers who have enthusiastically supported our work, without which our successes would not be possible. We would also like to thank the independent researchers who conducted the study and authored the report, Amy Mickel, Ph.D. and Leigh Goldberg, for their tireless and innovative approach to advancing this field. For copies of the report, questions or more information, and requests for future publications, please contact sfarrell@parksconservancy.org.